We love our children with all of our heart and only want the best for them. Sometimes though they do things that aggravate us in ways never we thought possible and push buttons we never knew we had. It’s difficult to think clearly and make good decisions when we’re angry. Anger can cloud our minds and make it hard to think about anything other than the negative. When we’re angry at our child it’s important to control our emotions and not say things we may later regret. A skill we can use is to give ourselves time to cool off before talking to our child about why we’re upset. Tell the child that we’re upset with what they did and that we’ll talk about it once we’ve had time to cool down. This isn’t letting them off the hook for the behavior that made us upset; it’s giving us time to collect ourselves before we deal with the situation. Once we’ve stepped back it’s important that we think about what’s making us angry and ask ourselves some questions. How serious of an offense was our child’s behavior that made us angry? Was our initial anger justified or are there other things going on in our life that may have affected how we reacted. What would we like to see be the outcome of this situation? Stepping back helps keep anger from leading to a fight where we say things we later regret. Taking time to cool off can help us have a better conversation with our child about why we’re upset and what our expectations are for them. Our children learn how to interact with others by watching and mimicking us. 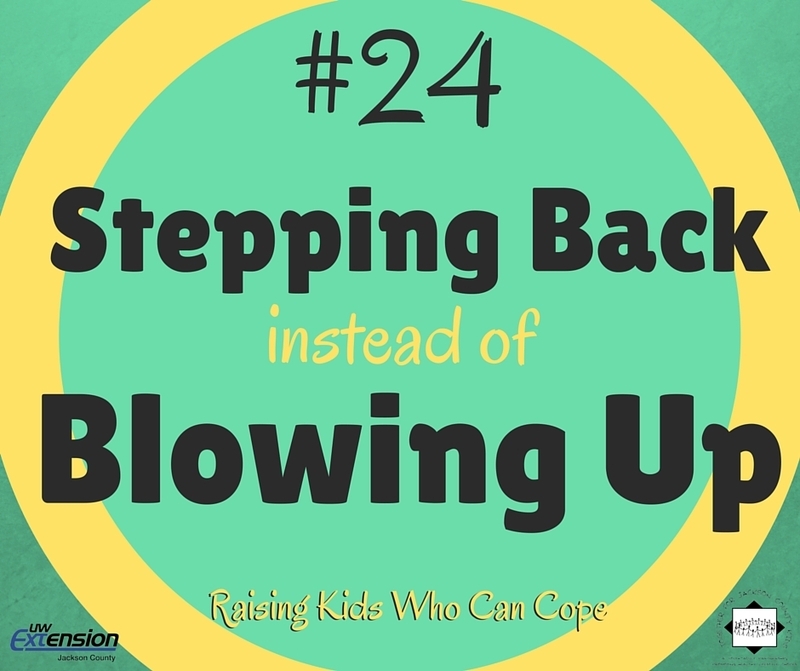 By stepping back before blowing up we’re teaching our children that we control our emotions, our emotions do not control us. This entry was posted in Raising Kids Who Can Cope and tagged coping skills, emotions, managing stress, youth. Bookmark the permalink.